SKU: PKD07. Categories: Party & Event, Tables, Chairs, & Tents, Tents/Canopys. Tags: canopy walls, frame tent, sidewalls, tent walls. 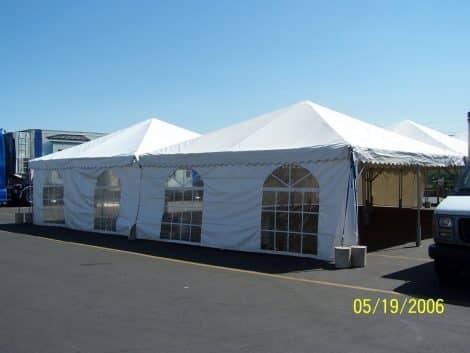 These canopy sidewalls will only work on 20′ x 20′ frame canopy’s! These canopy weights are used when staking the canopy down is not an option. Price listed is per 100 pound weight. Each 20′ x 20′ frame canopy requires at least 1200 pounds of weight. More weight may be required by All Seasons Rent All based on wind speeds at time of tent set up and location where tent is to be set up. Weights can be either lead, cement, or a combination of the two. Weights are ONLY AVAILABLE FOR FRAME OR MARQUEE STYLE CANOPY’S!